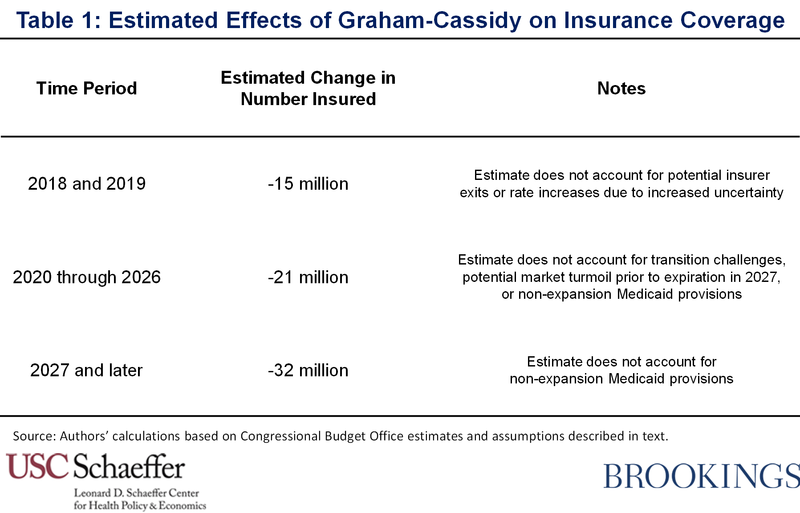 Based on this analysis, we estimate that the Graham-Cassidy legislation would reduce the number of people with insurance coverage by around 21 million each year during the 2020 through 2026 period. Policy changes in 2020 through 2026: Starting in 2020, the legislation would also eliminate the ACA’s premium tax credits and cost-sharing reductions for people purchasing individual market coverage, as well as the state option to expand Medicaid to cover low-income adults with incomes under 138 percent of the federal poverty level. Those programs would be replaced with a block grant to states, which states could use for a variety of different purposes and which would, in the aggregate, provide less federal funding than would have been provided through individual market subsidies and the Medicaid expansion under current law. States would be permitted to waive a range of individual and small group market insurance regulations, including regulations that bar insurers from varying premiums for based on health status and that require insurers to provide certain benefits.1 The proposal would also impose a per capita cap on federal funding to state Medicaid programs, which would drive further reductions in federal funding. There are no apparent legal barriers to diverting funds to unrelated uses. All states would need to do is identify existing state health care programs that qualify for block grant funding, thereby freeing up the state dollars currently devoted to those program to be used in whatever way the state wishes. If this were a state’s goal, the legislation makes it easy to achieve. Total block grant funding under the Graham-Cassidy proposal is $200 billion in 2026.3 States could almost certainly use block grant funds to support programs that provide substance abuse and mental health services; non-Medicaid state and local government spending on such services is likely to be on the order of $50 billion in 2026.4 As another example, states could likely use block grant funding to finance health benefits for state and local employees; state costs in this area are likely to be on the order of $200 billion in 2026.5 Thus, these expenditures alone are more than sufficient to absorb the block grant funding that the Graham-Cassidy legislation would make available in 2026. States would likely identify many other categories of existing programs that could be funded with block grant dollars, such as programs that compensate medical providers for uncompensated care or spending on health care for prison inmates.6 In other instances, states might be able to direct money into their general funds by funneling them through public hospitals. While it is likely that some of these uses are not intended by the legislation’s authors, many of them may be difficult to disallow while still providing states with the broad discretion over the use of the block grant funds that the authors clearly do intend. At one end of the spectrum are the 19 states—accounting for 39 percent of the U.S. population—that have not expanded their Medicaid programs under the ACA. These states have demonstrated that they place a low value on coverage programs since, for each dollar a state devoted to its Medicaid expansion, it had to forgo at most 10 cents of other state spending. Investments in coverage programs would be far less attractive under the Graham-Cassidy legislation because devoting an additional dollar of the block grant funding to coverage programs requires forgoing a full dollar that could otherwise be devoted to other state programs.7 While it is conceivable that some of these states could respond differently to Graham-Cassidy because it was enacted by Republicans or because states are willing to pay more to avoid reductions in insurance coverage than to increase insurance coverage, these states seem particularly likely to find it attractive to divert block grant funds to uses other than new coverage programs. As a final note, a long literature in economics has examined how state and local governments adjust their spending in response to the availability of targeted federal block grant funding. 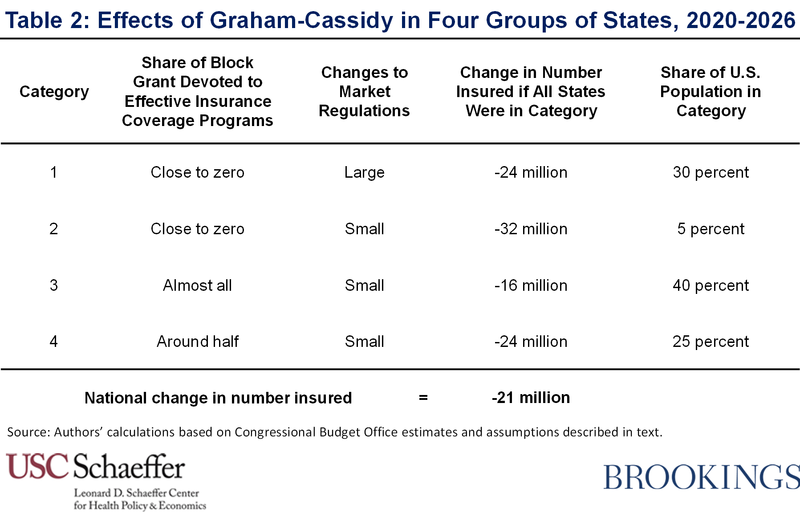 That literature has found that states often do divert a large fraction of block grant funding to unrelated uses, although the extent of diversion varies widely from setting to setting, from near complete diversion in some settings to virtually no diversion in other settings.8 The possibility that the Graham-Cassidy funding will be diverted to unrelated purposes thus has ample precedent in prior experience. Building on the discussion above, we estimate the overall reduction in insurance coverage that would occur under the Graham-Cassidy legislation using the following two-step process. First, we assume that states would fall into four broad categories and identify prior CBO estimates that reflect the nationwide effect on insurance coverage if all states nationwide adopted the relevant approach. Obviously, there would be variation across states that is not captured by our categories, but we believe that these categories capture the most important dimensions of variation.9 Second, we make our best estimate of what share of the U.S population would fall in each category of state, recognizing that there is considerable uncertainty about what states would actually choose to do. Category #3: States that devote almost all block grant funds to effective insurance coverage programs and make few changes to market regulations: These states would place a high priority on using block grant funds to increase insurance coverage and would therefore devote most of these funds to coverage programs. Because of the comparatively significant subsidies provided to the individual market in these states, they would not be compelled to make significant changes to market regulations. The total amount of block grant funding available under the Graham-Cassidy legislation roughly matches the federal spending on Medicaid expansion and Marketplace subsidies that would occur after the significant reductions in insurance coverage attributable to repeal of the individual and employer mandates.10 Thus, if every state adopted this approach, the national effect of the Graham-Cassidy legislation on insurance coverage would be similar to the effect of “skinny repeal” bill the Senate considered this summer, which CBO estimated would reduce insurance coverage by 16 million people by 2026. We assume that states accounting for 40 percent of the U.S. population will take this approach, somewhat more than the share of people living in states that currently operate their own Marketplaces under the ACA.